Seeing the night sky from a dark site is something most people don’t do very often, now that most of us live in cities. The vision of the Milky Way overhead can be startling, and a pair of binoculars make it more so; revealing that its delicate structure is made of millions of stars. This long-exposure photo of the dust lanes in our galaxy  is our first image that can really change your perspective on yourself and your place in the cosmos. When the Moon is just a thin crescent in the evening sky you can often see the rest of its face, dimly lit, and slightly reddened. 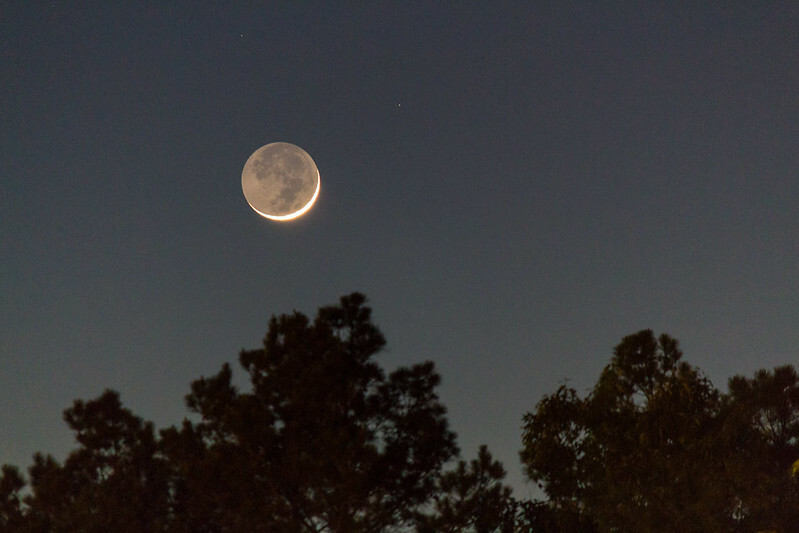 This part of the Moon is not being illuminated by the Sun, like the crescent shape itself, but rather by the reflection of light from the Earth where the Sun has not yet gone down over the horizon. You’re seeing other people’s daylight, bounced back at you from around the world . Sometimes a change in perspective can be quite literal – as with this video of the Earth seen from the International Space Station. The green structures are aurora- the Northern Lights over Canada in this case. You can also catch the occasional flash of lightning. This time-lapse is haunting and shows you a view you could probably never otherwise see. The Andromeda Galaxy is our nearest neighbouring galaxy and can be seen as a faint fuzzy patch in the Northern Sky. What is amazing though, is to realise that in fact it is quite a large object – bigger than our own Moon in our sky. Out eyes just don’t see it very well! Long-exposure images show just how big it really is. Combine this with the fact that it is 200 million light years away  and you begin to realise that the galaxy next door is truly enormous. It’s about the same shape, size, and type as our own Milky Way too. So we will look pretty similar to anyone looking up at the sky from a planet in the Andromeda galaxy. There are perhaps no images quite as humbling and shifting as the set of images we would probably call the ‘pale blue dots’. These are the small set of mages of the Earth from far, far away taken by the robots we have sent out into the Solar System. Voyager 1 took one in 1990 from 4.7 billion light years away; Cassini has taken more than one from the Saturnian system (like the one above); a few have been taken from Mars too. All of them show the Earth as just a pixel or so across: encompassing all of humanity, the world, and all life as we know it into a teeny tiny speck against the cosmos. These dark blobs hidden within the star-forming complex of the Orion nebula are known as proplyds – or protoplanetary disks. These are embryonic solar systems in the making. Each of these blobs is far larger than our own Solar System (they get smaller as they evolve into spinning orbits) which gives you some idea as to how large the Orion Nebula is in total. We were once shrouded in such a dusty blob ourselves – though long before the Earth formed. The largest surveys of galaxies reveal a structure in the Universe so vast that is practically beyond comprehension – but let’s try anyway shall we? The Sloan Great Wall is a filament of galaxies, snaking through the Universe that appear to be physically connected to each other – bound by gravity. The ‘wall’ is 1.38 billion light years across. That’s 1/67th of the observable Universe! When light is emitted on one side it doesn’t reach the other end for 1.38 billion years. It is 1,600 times a long as the distance between the Milky Way and Andromeda. I told you it was hard to imagine. I thought it would be good to end on something a little closer to home. On December 24th 1968 astronauts Bill Anders, Jim Lovell, and Frank Borman were the voices heard on one of the most-watched television broadcast of all time. As they read passages from the Bible’s Book of Genesis, they broadcast a grainy image of the Earth, as seen from the orbit of the Moon. The world watched themselves from space for the first time, and saw the Earth as a singular marble, set against the deep black of space. The image has since been remastered and still represents an era, and a moment in human history, that many find totally perspective changing. A symbol of a race of beings from a tiny planet, venturing outward to explore space and the worlds beyond their own. Remarkable. I recently had my first go at some proper astrophotography from a dark site. My target was the Milky Way and the result was this image of the dust lanes of our galaxy toward the centre of the galaxy. I’m pretty happy with it for a first go. This effect can also be seen on other moons around other planets and is generically called ‘Planetshine‘. This also serves as a good reminder that there is a part of the Moon we never see – the far side – which is lit by the Sun, but just never seen from Earth. That distance gets smaller all the time, and Andromeda will actually collide with us in about 4 billion years. Scary stuff! I made these images for a talk I gave a while ago, inspired by @DrChrisDavis and using data from WOTM. Just found them and thought I might as well post them up.